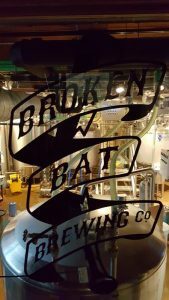 Broken Bat’s beers include our favorite, their Straight Chedd Apricot Pale Ale, with the Harry Cherry Tart Cherry Hefeweizen a close second. There’s also the Golden Sombrero Pilsner, the Ugly Finder IPA, Climb the Wall Farmhouse Ale, the Corre Corre Mexican Lager, the 755 (in salute of Hank Aaron) “King” Imperial Stout, and limited editions like the occasional Light Tower Power, a Chardonnay barrel-aged Imperial Farmhouse Ale. Pictures depicting the origins of their beer names line the walls, and if you’re a baseball card fan you’ll want to make multiple trips to the restroom. Our favorite is their Straight Chedd Apricot Pale Ale, which is unique in a number of ways. How often do you see apricot in beer in the first place? 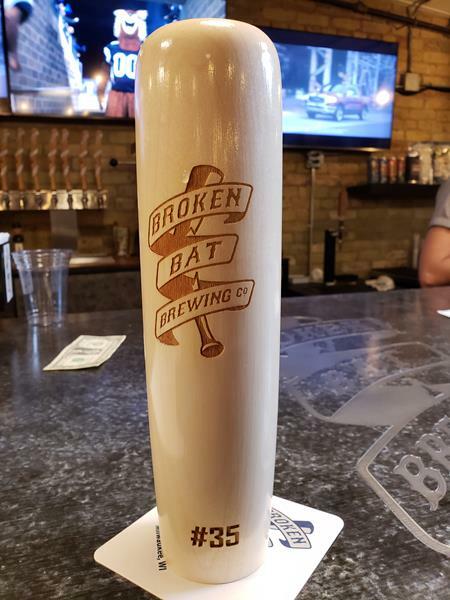 This became the first beer Broken Bat Brewery began to offer in cans, which you can purchase to-go from the Tap Room or at an increasing variety of retailers in the Milwaukee area. They’re available in multiples of up to four cans. Watch for other varieties of their beer to become available in cans soon as they continue to grow. Broken Bat Brewery’s Tap Room is open select Tuesday-Thursday 4pm – 10pm, Friday and Saturday Noon – 11pm, and Sunday from Noon – 7pm, with occasional changes in hours based on select Brewers – and sometimes other – games. There’s no kitchen but they do offer flavored popcorn varieties and you’re welcome to bring food in. Heck, Shake Shack and Aloha Poke are right cross the street, and Jing’s Chinese is right next door. 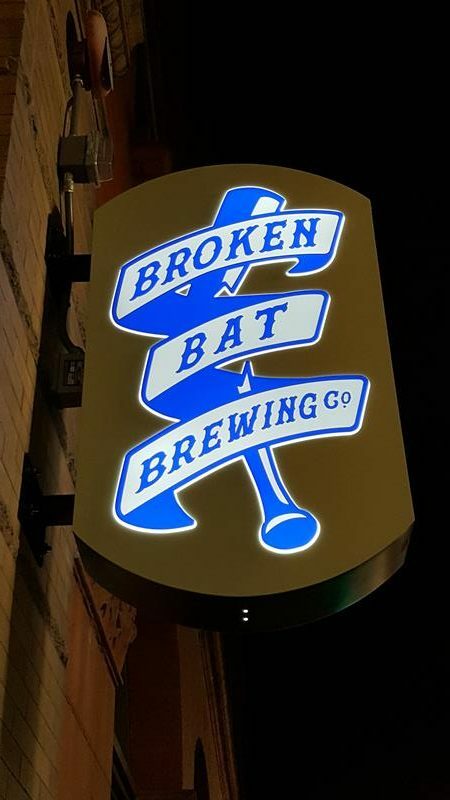 Broken Bat is also dog-friendly and welcomes your pooch with dog treats and Brewers-themed water bowls. 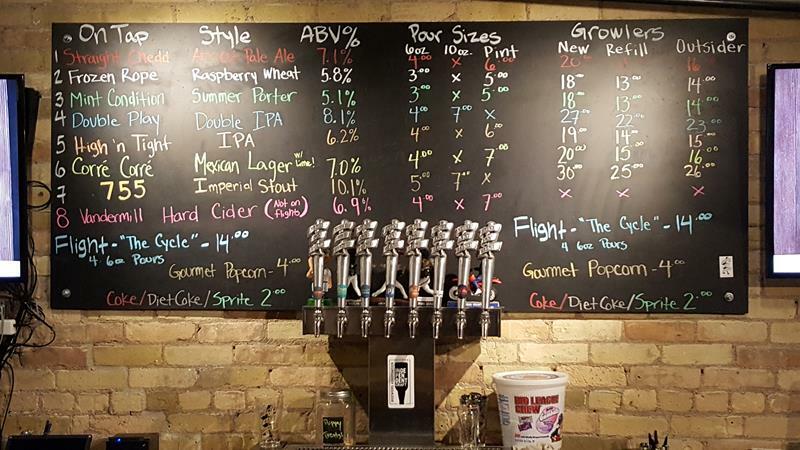 Broken Bat Brewing’s “Mug Club” is basically a bat – not a broken one – that you drink out of. The bat, weighted down for minimal spilling potential, holds 12 ounces. Mug Club members pay the 10-ounce price and every 5th beer is free. You’ll find Broken Bat Brewery in Milwaukee’s Third Ward, between Water and Broadway on Buffalo Street just south of I-794 and U.S. 18. Highway 32/Milwaukee Street is less than two blocks east. Broken Bat places sandwich boards on Buffalo, Broadway, and a few other streets to help with wayfinding… and serving as a telltale sign for when they’re open.